We strongly advise players to steer clear from Bingo Flirt and pick one of the recommended websites instead. The online casino has been blacklisted after failing to honor its contractual obligations which resulted in non-payment to affiliates. After experiencing this kind of business conduct towards affiliates we can only assume what will happen to players. Are you feeling a bit of delicious flirtatious fun heating up? For some players the biggest Bonuses are the prizes you will send to that special someone every time you win. 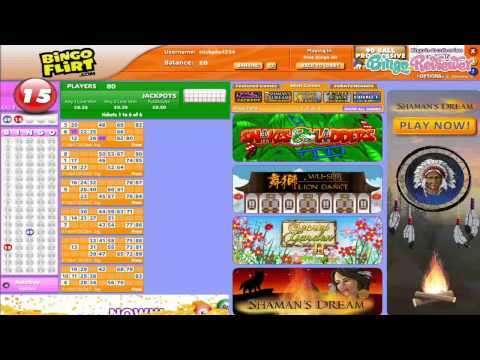 Bingo Flirts invites you to start winning today and make some bingo friends along the way. Love is in the air and Bingo Flirt is blooming lots of hearts. It is the friendly mascot with the curled up lip on one side like Elvis Presley except this red heart doesn’t wiggle his hips. Instead he has the gift of flirting, literally! Bingo is the name of the game at this site and flirting is the art you will master in this adorably themed online site. Bingo babes will teased with enormous Jackpots and at the same time make sweet advances to their loved ones by sending them the same winning prize they won! Bingo Flirt is not shy when it comes to incredible promotions and prizes that will seduce players in complete surrender. Bingo Flirt launched in 2010 and is powered by Dragonfish, a world class leader in bingo products. Granted a license to operate by the Government of Gibraltar the site brings you the best gaming possible in a safe regulated environment. There is a Bingo room for everyone with Nifty Ninety 90 ball bingo, High Rollers 75 ball bingo, 90 ball Free Bingo and Swedish Bingo the latest craze with 5 ways to win. There is always a game waiting for you with a new one every three to five minutes around the clock. Keep your eye on the bingo ball that drops every 3 seconds. Play in Autoplay for a hands free experience. Chat Games are brimming with fun games with loads of Loyalty Points up for grabs to the winners and it is all played inside each 90 ball and 75 ball bingo room hosted by your friendly Chat Moderator. Now coming “oh so close” counts in the 1Tg/2T Jackpot games are available when a player does not win the main Jackpot. There are over fifty 3 reel and multi reel Slots with Progressive Jackpots that offer up to a staggering £15,000 in prizes. Be sure to play the Adventure and Fantasy Slots for a spinning frenzy of thrills. The Classic Casino offers Keno, Roulette and Scratch Cards. This very loving bingo site offers Free Bingo like players have never experienced before with an unbelievable £6,000 given away every month. There are two Free Bingo rooms open daily for a chance to win something for nothing. After joining a warm Welcome Bonus is waiting for you when you make your first deposit. That’s not the end of Bonuses because every deposit thereafter is awarded with a Re-load Bonus. Exclusive Promotions offer Jackpots that are ready to scoop up for lucky winners. For the latest Bonuses and promotions subscribe to Bingo Flirt’s newsletter and stay up to date on all the current incentives. Millions of Loyalty Points are given away in Team Bingo to the top three winning teams. The Loyalty program is tiered and every level is better than the last with handsome benefits including monthly Cash back, exclusive promotions and so much more. Double your Loyalty Points during Happy Hour and watch them grow fast. Make sure to invite your friends and a sweet Bonus is yours in the Refer a Friend promotion. There is always a new and exciting promotion to make your gaming experience the best possible. It is exciting to win, but what’s even better is gifting a friend with the same win. Players will find these type of incentives throughout the site with Chat Games where you pick a bingo roomie to receive your same winning prize or three above you and three below you win too. Bingo Flirt creates strong bingo connections and we rate them with 4 Pink Hearts. I have played at Bingo Flirt for about two years now and like the fact i can make small deposit of £5. That is just enough too to qualify me for the free bingo rooms. I have won and sent a gift to a friend and it really builds nice friendships. Cashout takes a couple of days and that works out great for me. My only real complaint is customer support takes longer to respond to my emails than i would like. I have waited a bit longer than one day on one occasion. Being a shy flirt anyway i get a kick out of this name of this site and was immediately drawn to it. When first saw the tab How to Flirt i thought oh my here will be this great tutorial to get my out of my shyness! But actually it was how to play bingo and get started. What is really nice about this site is sharing prizes with a friend. I have shared a couple of prizes already and it really makes for good friends. I've never been good at flirting. Maybe I feel too guilty about it for some reason. But here is a place where all inhibitions are put to rest- Bingo Flirt. It almost sounds a little naughty! But once you are in there, you lose all inhibition because everyone is here for the same reason. BINGO! Well, that and flirting with your bingo friends by sending them little presents to show how much you appreciate them (flirt flirt). Dragonfish software and a nice secure hold on your personal information makes you feel comfortable with sharing the love and your details at Bingo Flirt. The slot games here are the ones you've grown to love from Dragonfish, with great graphics and fun themes and features you won't get at other sites. A wide variety of bingo for any budget awaits you here with one great advantage of getting to share the love with your buddies in many ways. Chat mods are excellent and keep the games flowing. You won't be bored here, and you will probably make a lot of new friends. Who knows what a little flirting might lead to. Perhaps a jackpot or a million in points for your team of flirtatious new friends. I was never too much of a fan of online flirting, so I was a bit cautious about the site that kind of combines it with bingo. I was really happy to see that it is just another theme, and not a real dating site. You do have a nice chat option of you are interested, so if you desire to meet someone, it's all covered. If you like small deposits and playing for free, you will find some nice offer, with as low as £5 minimum deposit and access to free rooms. As a Dragonfish software site, I recognized most of the games, as well as offers, and there is more than a hadfull to chase. I got a decent sign up bonus, and no problems to claim it, and used it to get a nice little sum. Bingo Flirt proved to make a swift payouts, and that is one of the most important things for me. This is one of my favorite sites to play at! Their initial welcome offer is a bit iffy though if you’re looking to not have to deposit right away. Basically, they will give you £30 free when you make an initial deposit of £20. But this is still a nice deal and there are many other features at the site that any kind of player will enjoy! They have a wide variety of bingo rooms to choose from as well as some decent jackpots, including coverall and progressives to look out for. There are three types of bingo here. They include 75 & 900 ball as well as high five bingo. They also have team bingo games to engage in, which is one is definitely one of my favorite ways to play. In addition to bingo, they’ve got a ton of other games to play as well, including a huge selection of slots!